From being nineteen and perpetually broke, forty-five years on George Reilly is now rich, successful and very pleased with how his life has turned out. He can look back with indulgence on the follies of his teenage self, at the pleasures of loves and friendships and the pain at their eventual loss. Though he doesn’t yet realise that his past was never really behind him and that his precise and ordered existence is poised to descend into wholly unexpected turmoil. Style is a brilliant exposition of maniacal parental ambition within a society in thrall to celebrity and fashionable acquisition. 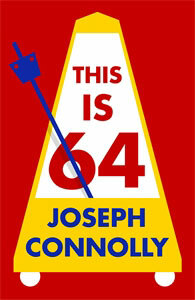 Joseph Connolly's utterly topical, finely written and cruelly funny novel draws one into a web of comic and startling lives, each increasingly poisoned by fatuous obsession, suffocating love, appalling duplicity, and the sacrifice of innocence. 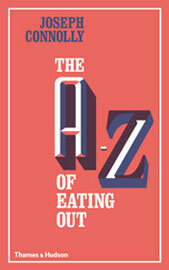 The very first book on the subject – not a restaurant guide, not a cook book, but 150 alphabetical entries that tell you all you need to know about the whole fabulous and sometimes maddening business of eating out. A beautifully designed hardback from Thames & Hudson. 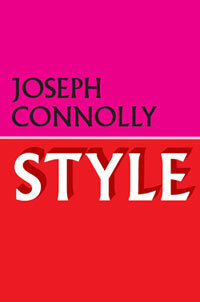 You are welcome to browse the various pages of the Joseph Connolly Website. Pretty much all the relevant information is here – but the real point of all authors is, of course, just the books (and in particular the novels). It is hoped that these are what you will read next. Joseph Connolly is the critically acclaimed writer of eleven novels published by Faber & Faber (all of which are in print) as well as eleven non-fiction works including biographies of P.G. Wodehouse and Jerome K. Jerome. Fiction: POOR SOULS, THIS IS IT, STUFF, SUMMER THINGS which was made into an internationally successful film starring Charlotte Rampling, WINTER BREAKS, IT CAN’T GO ON, S.O.S, THE WORKS, LOVE IS STRANGE, JACK THE LAD AND BLOODY MARY, ENGLAND'S LANE, STYLE, THIS IS 64. In 2009, Joseph Connolly was appointed restaurant reviewer for the weekly London newspaper The Hampstead & Highgate Express (Ham & High). Please see the Restaurant Reviews in this website which carries all the reviews to date, and will be regularly updated as each new review appears. London SW1Y 4SP. Tel: 020 7393 4400. Email: Cb@curtisbrown.co.uk.